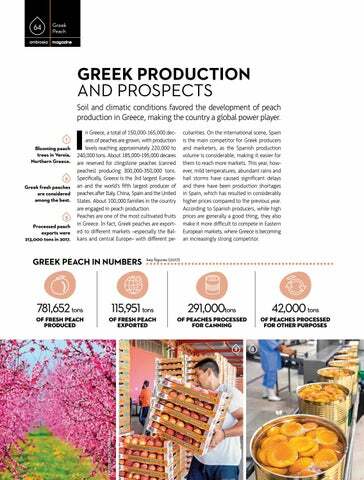 GREEK PRODUCTION AND PROSPECTS Soil and climatic conditions favored the development of peach production in Greece, making the country a global power player. 1 Blooming peach trees in Veroia, Northern Greece. 2 Greek fresh peaches are considered among the best. 3 Processed peach exports were 213,000 tons in 2017.
culiarities. On the international scene, Spain is the main competitor for Greek producers and marketers, as the Spanish production volume is considerable, making it easier for them to reach more markets. This year, however, mild temperatures, abundant rains and hail storms have caused significant delays and there have been production shortages in Spain, which has resulted in considerably higher prices compared to the previous year. According to Spanish producers, while high prices are generally a good thing, they also make it more difficult to compete in Eastern European markets, where Greece is becoming an increasingly strong competitor.